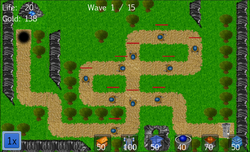 Point of the game is to protect your own castle from attacking enemies. Only on medium difficulty your task is gathering certain amount of gold. Catapult - Hits all targets in same area, small damage but effective against greater number of enemies, if enemy is further from the point of impact he takes reduced damage. This damage can be increased. Wizard tower - fast shooting, high damage but attacks only enemies with mana. After successfully finishing the level you get point according to rank of mission in given mode. In case you don't lose single life you gain double the amount. You can use points to upgrade towers or make the hardest mode "hard" easier. Catapult efficiency -increases the damage which enemies near the point of impact receive.